Automated Carriages | R.J. Kates Co. 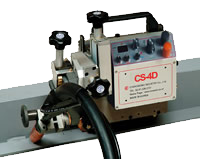 The Koweld CS-4D for a wall traveling stitch is light weight, small, and easy to handle for corner fillet welding using a continuous fillet carriage. Features an auto stop sensor for end of plate, displays the precise travel speed, and can be used on curved joints. 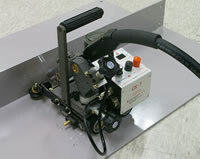 The Picle 1-II is a manually operated pipe cutting machine that uses a chain and gear drive system. The drive chain is comprised of durable, interlocking links that can easily be added or removed for quick change of pipe diameters. A graduated bevel collar ensures accurate bevel setting. 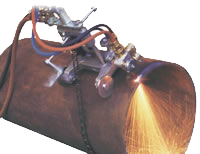 The Bug-O welding and cutting tools uses speed controlled rollers to turn pipe or other rounded material while the welding or cutting operation is performed. A remote foot switch allows hands-free run and stop control. In addition, a “forward/stop/reverse” switch with potentiometer allows for step less speed adjustment. An 8-slot turntable provides for quick mounting and holding of a fixture. 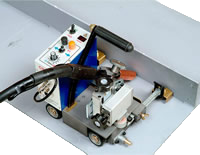 The Koweld CS-7 ia a fillet lighter weight carriage for stitch/continuous welding. Because the welding and non-welding distances can be precisely set and displayed the quality and precision of the stitch welding is high while the weld is applied at a constant speed. 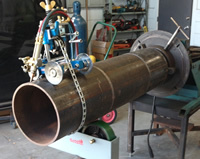 R.J. Kates has several of these track and trackless carriage devices for cutting pipe and welding corners. 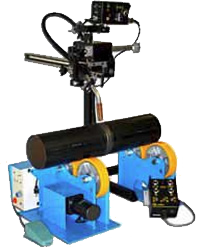 For more information on this featured pipe cutting track carriage and other track and trackless carriage devices, please call R.J. Kates at 858-565-6960.